The name Edward Snowden should be familiar to the audience. The NSA-contractor, turned whistleblower, provided top secret documents on the details concerning the surveillance program employed by the National Security Agency (NSA) to journalist Glenn Greenwald in 2013. Greenwald, who was working for the American online division of the British newspaper The Guardian, published in June 2013 a top secret report of the NSA collecting millions of phone records from Verizon users. In addition, the former Guardian contributor published information about the PRISM surveillance program, which collected various e-communications from Americans who used Microsoft and Google – just to name a few. Since the reveal of such sensitive information, Snowden has retreated into a self-imposed exile in Russia. He has been labeled both a whistleblower and traitor by the American public. In any event, his actions have raised questions on the treatment of whistleblowers in United States government. There is a call to action within the public service to protect these individuals, while battling corruption and voter mistrust. In all, governments are looking at ways to be more accountable to the public to which they serve. The United States is no stranger to whistleblowers. Samuel Shaw, the first ever whistleblower, filed a petition in which Congress enacted America’s first whistle-blower-protection law: “That it is the duty of all persons in the service of the United States, as well as all other inhabitants thereof, to give the earliest information to Congress or any other proper authority of any misconduct, frauds or misdemeanors committed by any officers or persons in the service of these states, which may come to their knowledge.” W. Mark Felt and Daniel Ellsberg released documents in the 1970s that implicated the federal government in wrongdoing and Linda Tripp help uncover the white house scandal between President Clinton and Monica Lewinsky. Fighting corruption in government is a challenge in itself; one has to deal with the bureaucracy (the red tape). 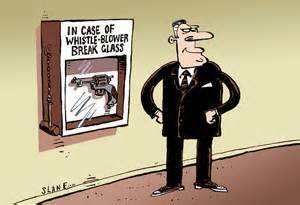 However, the most effective to protect whistleblowers and fight corruption in government is legislation. Vietnam is the best example. Studies have shown that many Vietnamese people fear denouncing corruption and reporting misconduct due to a lack of trust in the system and fears of retaliation. In addition, The Viet Nam Provincial Governance and Public Administration Index found that one in four Vietnamese citizens think corruption is the most serious socio-economic issue. The best example of effective legislation to fight against corruption is in South Korea. South Korea’s Anti-Corruption Act of 2001, the main purpose of defining a protected disclosure is to uncover corrupt activities in the public sector. Thus, in the absence of an effective legal framework, many people will avoid act in against corruption if there are no attractive individual incentives for doing it. When the government punishes those who reveal information kept from the public eye, it in turn creates voter mistrust. Voters will become cynical of their elected officials, especially American voters. America has long been a nation that is not interested in viewing itself with a critical eye. Content to refer to itself as the greatest country in the world, America does its best to avoid facing up to scandals and travesties in its history, be it the genocide of the Native Americans or the crimes during the Vietnam War, and the ones currently unraveling. To eliminate voter mistrust, the public must not be quick to dismiss whistleblowers. The public must be willing and able to question the actions of their government without fear of retaliation. By allowing democracy to work, voters will feel compelled to participate in our free-electoral process. Cooperation and full transparency is needed to protect those who wish to expose the truth. Americans and citizens worldwide are quick to dismiss a whistleblower, but don’t ever question on whether if they were in the same situation would they respond in a similar fashion. Would we do the same thing as Manning and Snowden? Would we have the appreciation for losing our jobs, perhaps even our freedom, to expose the wrongdoing of our government? Author: Andrew R Vaz, M.S., M.P.A. is a doctoral student in the Public Policy and Administration program at Walden University. He is a graduate of the Master of Science in Criminal Justice and Master of Public Administration double master’s program at Florida International University. He can be reached at [email protected].